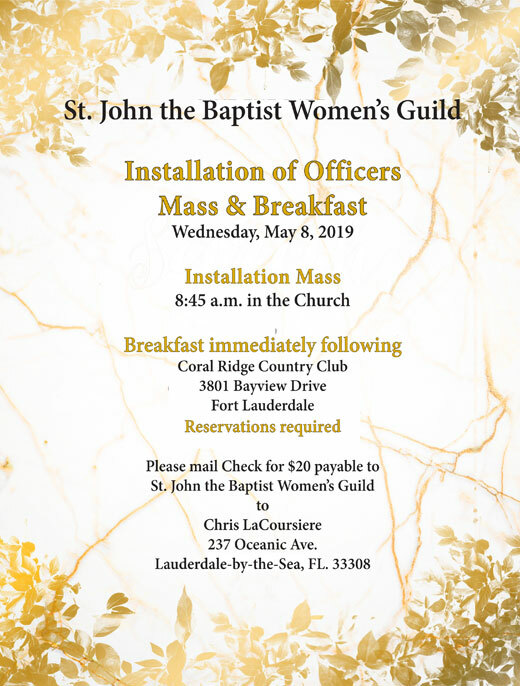 The Women's Guild is an integral organization of St. John the Baptist Catholic Church, serving the parish in fund raising activities as well as providing interesting cultural, entertainment, and spiritual fellowship activities for its members. The Women's Guild conducts monthly meetings from October to May on the second Wednesday of the month at 9:30am usually in the Parish Hall. There will be one evening meeting each year at 7:00pm when the schedule permits. BY-LAWS: A copy of the Women's Guild By-Laws can be viewed by clicking here.